We don’t use pop up drains in any of our bathrooms. These are stylish and will work great for all our bathroom sinks. The color is exactly as pictured. This grid design oil rubbed bronze bathroom sink drain is designed to reduce or eliminate overflow. It is made of brass and finished with bronze, giving it both durability and style, because it matches pedestal-style sinks, The oil rubbed bronze bathroom sink drain requires assembly, but this can be done with common tools. Nice finish. It's simply what we needed to match our copper sink. When my plumber came to install my sink, he could not use this drain. Even though it was labeled as 1.5 non overflow, he said it did not look like it and if he installed it, he said it would leak. need a grid drain and had a hard time finding the color, but here it is at Overstock. Fit my sink perfectly! Haven't had any issues since installing. "Will this drain work with the 13" copper vessel sink (item 13001233). If so, do all the parts necessary to work come with it." Hello smiley, it should work as the sink on item 13001233 accommodates a 1.5 inches drain. However, you might want to check the drain that is suggested to go with the sink, item # 11747357. 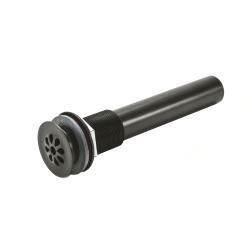 This pop up drain comes with a mounting ring designed to work with any vessel sink with a rounded bottom. Thank you for shopping with us. "looking for an oil rubbed bronze vessel drain (without overflow) with the strainer - no popup. the holes need to be smaller than my hard contact lens ($200 a piece) I currently have a beautiful drain, but it has 9 holes which are so small that the water doesn't drain well at all. Plus its a flat drain, not a domed one. Can you help me solve this problem - current drain doesn't drain well at all. holes need to be larger but not so large a small contact lens would slide down AND no overflow"